Yogi Dana Falsetti, left, has gained a large following on Instagram, drawing fans with her personal vulnerability and struggles with body image. Yogi Kino MacGregor, right, has come to the defense of Falsetti, who has been sued by yoga clothing maker Alo Yoga. Dana Falsetti isn’t your average yoga teacher. The 24-year-old Bucks County native stumbled on internet acclaim in 2016, when her advanced yoga practice attracted Instagram followers in droves. It wasn’t just Falsetti’s headstands or backbends that people liked; fans were drawn to her personal vulnerability, her struggles with body image, eating disorders and overall self-loathing, which she was eager to share with others enduring similar pressures on the image-driven social media app. As her following increased, so did business opportunities, which Falsetti painstakingly vetted. Her platform isn’t just “yoga.” It’s helping students heal from serious trauma through yoga. It’s rejecting cultural beauty norms imposed by big yoga corporations like Lululemon, which flagrantly shuns plus-size shoppers. Last summer, Falsetti actively began criticizing companies like Alo Yoga, a yoga clothing manufacturer, for almost exclusively using thin, ultra-flexible white women in their advertising and on their social media. Current Obsession — Alo Soft. Our most velvety performance fabric: perfect for practice & loves to lounge. Falsetti received waves of support from her fans, both veteran and future yogis from all walks of life. But last December Alo Yoga acquired Cody and the rights to all its content, including Falsetti’s videos. Falsetti resisted, via her Instagram stories, as she always had. Alo Yoga sued her for violating her contract after she disclosed non-public information on Instagram about the company’s acquisition before the deal was closed. As Falsetti’s legal troubles mounted and her lawyers insisted she remain mum on the pending case, another world-renowned yoga teacher, Kino MacGregor, wrote an essay defending Falsetti on "Elephant Journal," a yoga web site, and started a GoFundMe campaign to pay her legal fees. The campaign raised more than $50,000 in just a few weeks, but MacGregor told PhillyVoice that, even with the donations, Falsetti is barely breaking even and fears the worst is yet to come. 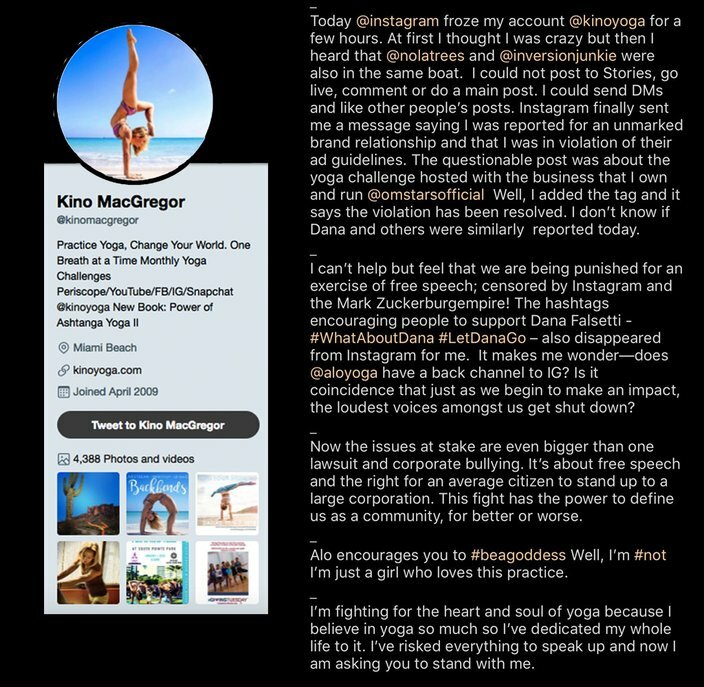 Kino MacGregor discusses on Twitter her own and fellow yogi Dana Falsetti's battles with the Alo Yoga clothing company. Kino MacGregor is not your typical Instagram yogi, either. Most of her contemporaries model a pretty rendition of a sacred exercise that’s become synonymous with skinny, beachy, blonde LA. But MacGregor journeyed to Mysore, India, 20 years ago to learn from the source. Amid today’s deluge of corporate yoga campaigns, which intentionally conflate materialism with spirituality, MacGregor teaches yoga fundamentals in an abundance of online tutorials and has more than a million followers on Instagram. Chip Wilson has long since stepped down from the corporate yoga scene, but Lululemon’s more recent competitors are even more pervasive with the rise of social media. Inside Instagram’s warped world, an ever-expanding pool of yoga brand ambassadors, models and certified yoga teachers muddies the waters between organic yoga inspiration and the marketing of clothing companies. “So many people come to the practice of yoga hurting, whether they’ve gone through some physical trauma or a sense of alienation. 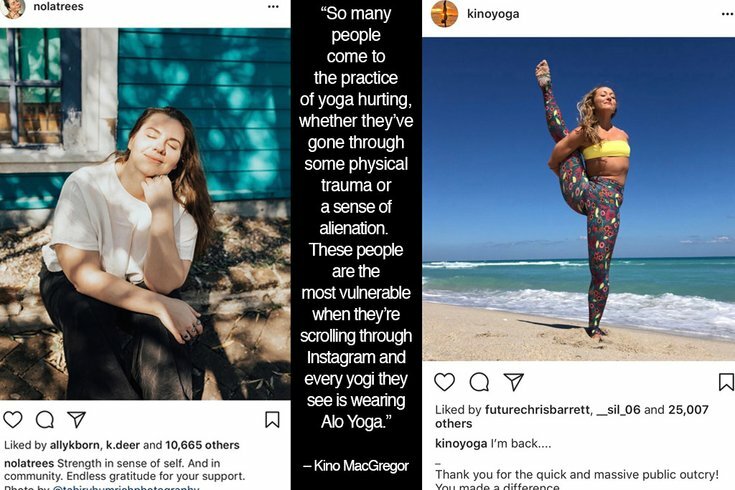 These people are the most vulnerable when they’re scrolling through Instagram and every yogi they see is wearing Alo Yoga,” MacGregor said. It’s not clear how much Alo ambassadors are paid to endorse the company’s clothing on Instagram. MacGregor believes that, for top-tier ambassadors with millions of followers, it’s enough money to replace a very lucrative full-time job. An Alo Yoga spokesperson declined to comment on ambassadors’ earnings to PhillyVoice. Later that month, Danny Harris, co-founder of Alo and CEO of its billion-dollar parent company, Bella Canvas, told Fashionista, "We have a Gigi Hadid or Kendall Jenner or these other people wearing the Alo brand, but we still are very true and authentic to who we are." MacGregor received some criticism for listing Alo’s brand ambassadors in her "Elephant Journal" essay. But she believes it was the right thing to do. People discuss the Falsetti-Alo Yoga situation on Instagram. “Of course people need to hold brand ambassadors accountable for what a brand does, because they push people toward that brand,” she said. MacGregor believes it’s no coincidence that Falsetti is that one yoga teacher, as she has devoted herself to being a voice for inclusivity and diversity in the yoga community, something Alo’s marketing still does not adequately reflect. MacGregor also recorded video content for Cody prior to the Alo acquisition. Since the Falsetti lawsuit, she has tried to reacquire her content or, at the very least, have it removed from Alo’s platform, because she does not want to be associated with the brand. According to Alo’s spokesperson, MacGregor was paid more than $536,000 for her content. In her "Elephant Journal" essay, MacGregor wrote that she received $450,000, which she invested in her own yoga video platform, OMStars. When she began speaking out about Alo, MacGregor says she received a cease-and-desist letter from the company’s lawyers and an offer to reclaim her videos in exchange for nearly everything she was initially paid by Alo. According to the Alo Yoga spokesperson, MacGregor's final offer was $25,000 down and then $50,000 more over two years, which came after she changed her terms four times. MacGregor said those claims are "patently untrue." Ultimately, MacGregor thinks the lawsuit against Falsetti is an attempt to broadcast what mainstream corporate giants can do to independent businesswomen who fail to conform. “Dana has already spent over $40,000 in legal bills and she has tried to settle with [Alo] repeatedly. They just refuse. Every little procedural turn, they are fighting tooth and nail. She just wanted her content taken down,” she said. But Alo’s spokesperson feels the company is striving for compromise, telling PhillyVoice, "We are in active discussions with Dana and have been working for some time to settle this lawsuit. It's Dana, not Alo, who has been slowing the process down." MacGregor believes the conflict could easily end in peace if Alo simply dropped the lawsuit.